As the school year begins, not only does daycare get busier, but the new season is a great time to redecorate and plan for the year. Designing with fun and functional daycare furniture is a productive way to change your environment! Kids and parents alike respond well to a new look. It’s a great tool for attracting new parents while showing everyone that you care about upkeep and investing in your business. Children react to change. Bright colors and new images keep them engaged and interested. Soft seating arrangements, such as Childrens Factory’s Bowtie Soft Seating, is a great and functional way to add a pop of color to any classroom. 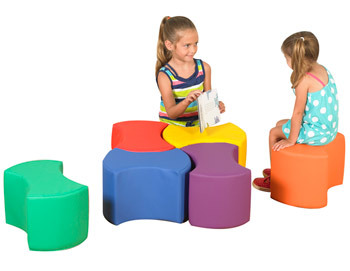 The fun shapes will give your classroom a unique look while providing flexible seating options. Even though it’s daycare and not school, the first years are the best time to expand the minds and imagination of little ones. You can accomplish fun and functional! Furnishings are ergonomically designed in today’s market. Finding good quality, beautiful pieces is easier than you’d imagine. Of course there are high-end lines of ready-made daycare activity furniture, but just a little creativity will turn any small-scale pieces into imaginative parts of your daycare theme. Take a child or children with you as you shop! They are the best at testing your options and separating the winners from the losers. Mark different colored chairs with numbers for counting and shapes for recognition. 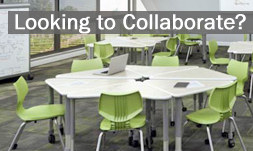 Do you have a small enough group and a large enough space to put temporary names on chairs or tables? Marco Group’s Stack Chairs W/ Matching Colored Legs are durable, colorful and economical, making them perfect for young classrooms. Any smart business person is mindful of their finances. Remember you get what you pay for. Higher prices mean products that attract new clients and longer life! Making your tiny charges responsible for your new pieces helps instill pride and responsibility, while also protecting your investment.